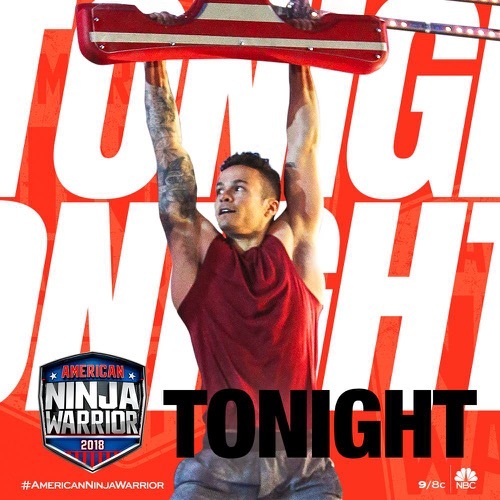 Tonight’s episode looks like it is going to be a great season 10 episode 5, so be sure to tune in for our coverage of NBC’s American Ninja Warrior at 9 PM – 11 PM ET! While you wait for our American Ninja Warrior recap make sure to check out all our American Ninja Warrior news, spoilers, recaps & more! “American Ninja Warrior” was back in Philadelphia for tonight’s all new episode. The course for tonight was at an abandoned power plant. The plant lit the city for sixty years before it was retired and so it was only fitting that first competitor of the night was retired NFL footballer Jason Avant. He used to play for the Eagles as a wide receiver and it turns out he was a huge fan of the show. Jason had even trained with a famous ninja in preparation for his own run and that along with his past as an athlete was all the preparation he needed. He had some struggle with disembarking off the Floating Steps and afterwards it had been smoother sailing. Jason was the first to go up against the Spinning Bowties and had no problem with it or the Broken Bridge. The problems came on the Wingnuts. The Wingnuts was the fourth obstacle of tonight’s course and it required the competition to hold his entire body weight with just his fingers. Jason who was coming in at over two hundred pounds had been too heavy to hold on and he fell on the last wingnut. For a newbie, he had made it very far and depending on his timing he might still have a place in the City Finals. The next competitor of the night was the much beloved Principal Stuart Warshawer. It seemed like the entire student body showed up for him and it was something he well-deserved. Stuart was placed in a low-ranking school and within a few years he managed to turnaround test scores and also inspiring his students to always pursue their dream. Stuart, who was an athlete during his off-time, had believed he wouldn’t have a problem with the course and surprisingly he fell early on. There would be few that tried out over the commercial break and none would make it as far as Jason Avant until the show picked back up with Paul Ruggeri III who was a notable gymnast. The gymnast from New Jersey had suffered some minor setback with the Broken Bridge and just managed to save himself from falling into the water. The commentators thought he could have exhausted his upper body strength with that and instead he had no problem with the Wingnuts. He was the first of the night to make it to the Lightning Bolts and unfortunately fell due to the placements of his hands. The next competitor to try out tonight was Helen Lin. She was an ice swimmer which meant she would go out into the dead of winter to go swimming and that meant she would often swim in sub thirty degree water. Helen believed that helped her for this obstacle course and it turned out she was wrong. She too had a problem on the Broken Bridge and unfortunately she wasn’t able to pull herself back up, so she went for a little swim in much warmer waters that she was used to. The next competitor was Chad Riddle. The kindergarten teacher had tried out on the show way back on the sixth season in which he fell on the fifth obstacle. That time his mom hadn’t been able to go and so he made sure she was there tonight. Chad used the four years he was away to build his own obstacle course and he’s been practicing in all that time. The competitors believed that alone could have made him a stronger competitor than before and so everyone expected great things from him. Chad was able to fly past the first four obstacles with the fastest time yet and he was the first to make it past the Lightning Bolts. So he had his pick of the Mega or Minor Warped Walls and he chose to go after the minor one where he became the first person of the night to complete the course. He was so moved by making it that far that he even pressed the buzzer twice and had a good cry up there. And so with completing the whole thing, the pressure was on for the others to do the same. The next competitors was Ryan Carson. He was a physical therapist and he wears a prosthetic leg. Ryan had an accident in 2012 in which he tried to jump a fence and it caught him right behind the leg, the doctors had tried to save it and were forced to amputate when they couldn’t. That could have broken Ryan and instead his father told him not to make that an excuse. Ryan took that to heart and he didn’t let his loss keep him from the gym. Tonight Ryan had no problem with the first obstacles and raced through them with good timing however he fell on the Lightning Bolts. He seemingly lost his grip on the bar and that was that even if he wasn’t letting it get him down afterwards. The next competitor of the night was Casey Rothschild. She was a newbie that was able to try out for the show since the age was lowered and so this college student was hoping her past skills of learning the circus arts as well as rock climbing. Casey had a hard time with getting off the Floating Steps and then it was like she was made for the other obstacles. She sailed through them and had been the second person to make it to the Warped Wall. Casey chose to go after the Minor Warped Wall and had failed going up twice before her ninja coach the legendary Drew Drechsel calmly told her from the sidelines to relax before she goes charging up the wall. And when Casey did as suggested she was able to make it up on her final attempt. Casey became the first rookie of both women and men to hit a buzzer and she was also the third woman this year to hit that buzzer. The next competitor up was a veteran. Chris Wilczewski had taken some time from the show because he experienced an ordeal. He had been out by the water by himself when suddenly a tide came and pulled him in. He was in the water for thirty minutes before he was able to get out and unfortunately he suffered panic attacks afterwards. Chris used the time he took away to properly deal with his anxiety and he was back because he believed he was ready. If anything he was stronger because of that time he took off. He raced through the obstacles and he became the first person of the night to go after the Mega Warped as well as the first person to hit a buzzer on the Mega Warped Wall. Anthony DeFranco was up next. He too was a veteran and everyone was expecting that he would be the next person to finish the course, but Anthony never made it off the first obstacle. His leg either cramped up or he overthought it because he never reached the third step in the Floating Steps and that was it for him. He was out and the crowd had been shocked into silence. Now, there were several other veterans that had gone up and made it to that buzzer though it was always shocking when they don’t finish and so expectations were high for Michelle Warnky. She was a veteran of the show and was known to have trouble on the fifth obstacle. This time around she managed to get past the fifth obstacle and was given her first chance in four years to hit a buzzer. Michelle chose to go after the Mega Warped Wall and she missed. Michelle was then given a second chance on the Minor Warped Wall and she was able to hit the buzzer for the first time since season six. There were six finishers by then and two of them were women however the night wasn’t over yet. There were two rookies. Nicholas Kupper and Darion Bennett and they had both showed promising starts until they fell on the Lightning Bolts. The next competitor was one of the oldest competitors. She was Daria Beird and she was mother of Allyssa Beird. Mother and daughter had trained together for tonight and up first was Daria. She had no problem with the first obstacle and she was having no problem with the second until she dismounted just short on the landing. Her daughter Allyssa went next. She was an unknown two years ago and now she was a star. Allyssa coaches others and she has even been highlighted on the Ellen DeGeneres show. So with so many women making it further than ever before, all eyes were on Allyssa. Allyssa was able to make it pass where her mother fell and she had no problem with any of the obstacles. She became the third woman of the night to make it to the Warped Wall and she chose to try her hand on the Mega Warped Wall. She didn’t make that one yet she did make it up the smaller Warped Wall becoming the third woman of the night to finish the obstacle course. That would be it for the women only what a night for them. But the last veteran of the night was Najee Richardson. Najee seemed to be having cramps because even as he began the course, he kept grabbing his calves. He had no problem with making it past the many obstacles and so the cramping only seemed like it was going to stop him from making a go on the Mega Warped Wall. The commentators didn’t think he was going to go after it and he surprised them by going after it. He ran up that wall and managed to hold on using only one hand. There was twelve that finished the entire course. It was nine men and three women though only two had made it up the Mega Warped Wall to receive the added bonus of ten thousand dollars.